Home » Blog posts » Do financial incentives motivate farmers to conserve land? 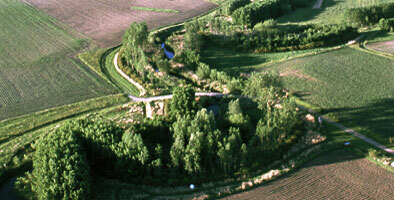 Riparian buffers are strips of trees and shrubs along stream sides. They filter nutrients and chemicals, shade and protect the stream, and provide habitat for birds, insects and fish. Photo courtesy of USDA. 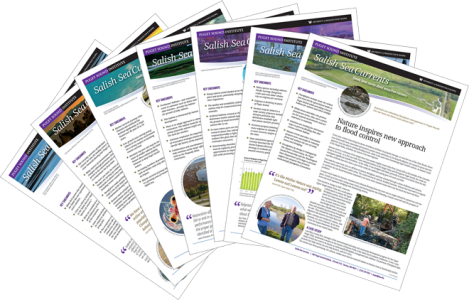 Occasionally, this space includes reports and essays from guest writers on the subject of Puget Sound ecosystem recovery. 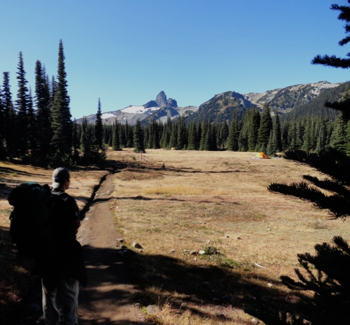 Today’s guest blog is from Mollie Chapman, who received funding from the Puget Sound Institute in 2013 to study how financial incentives influence decisions by farmers to conserve ecologically important land. One such program is in Washington State’s Puget Sound region, where I was asked to help program mangers understand how to better recruit farmers. When I interviewed farmers many told me of their frustration. The program paid the farmers to convert some of their streamside land to habitat—what are called riparian buffers. Yet once the trees and shrubs were planted, farmers were instructed not to touch the new riparian buffer habitat. The idea of leaving nature alone is common in the conservation and outdoor worlds. 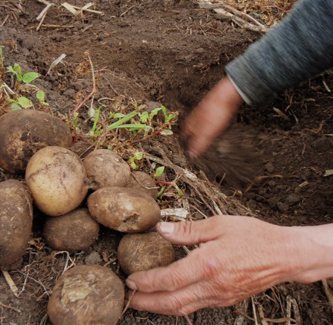 For example, wilderness areas often ask visitors to, “leave only footprints, take only photos.” But agricultural movements have a very different rallying cry, to keep their “hands in the dirt.” Being a good farmer means taking care of your land—and that requires getting your hands dirty. In our paper we analyzed several of these value conflicts between participants and programs. We based our analysis on relational values. Relational values offer a new way of thinking about values, or what matters to us and why. Most discussions of environmental values focus on the dollar value of something (instrumental value), or on its value based on moral standing (intrinsic value). We propose a third option. Environmental values are based on the relationships people have with specific places, landscapes, rivers, plants, animals or other parts of the natural world. Fig. 1. Key relationships help to understand what matters. 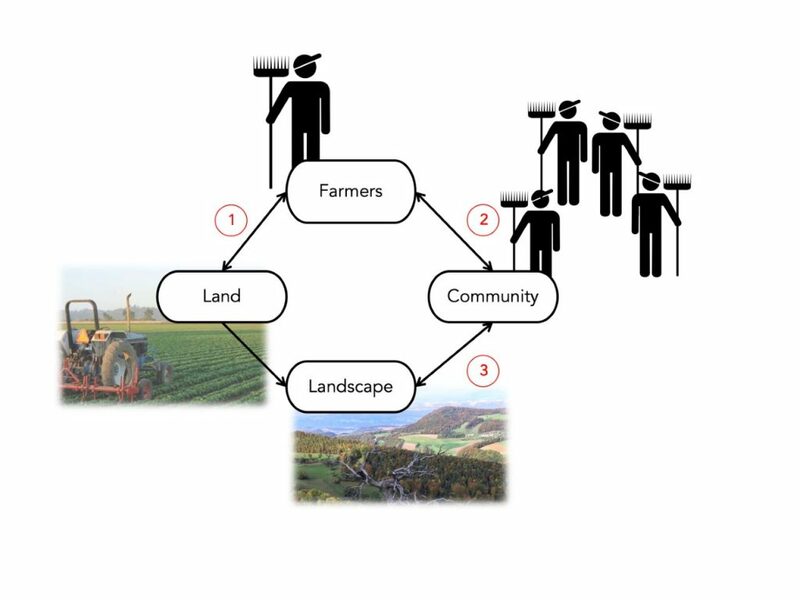 Farmers value their relationship to their land (1) and to their community (2). The farming community values its relationship to the landscape (3). I explained this conflict between farmers’ values and the program’s no touch rule to the new program leader. My analysis aligned with his own intuitive experience. A year later we spoke again. He had instructed his staff to start talking about the program using different language. Instead of describing the riparian buffers as “no touch” farmers were now told that they were growing a different kind of crop—a buffer crop. In our paper we identify the relationships that are important to farmers. We show how these relationships form the basis for relational values. Finally, we describe how relational values conflicted with rules or language used by the incentive program. The table below shows some of the relational values that conflicted with the ‘No touch’ rule described above. Fig. 2. The above four relational values of farmers all conflicted with the idea of ‘no touch’ riparian buffers. So, is money what matters most? Not for motivation. Most farmers can’t afford big projects like riparian buffers without financial assistance. But projects also need to line up with farmers’ values and relationships. Thinking about values and relationships can help all kinds of programs become more effective. Ill-considered financial incentives have led to poor outcomes in sectors from education to medicine, business to the military. The first step to designing better programs is to listen. Listen to those who will be impacted. Find out what is important to them. Which relationships do they value? What does it mean to them to do their job well? We recommend that conservation programs, even when they offer financial incentives, work to align with target participants’ relational values. Chapman, M., Satterfield, T., & Chan, K. M. A. (2019). When value conflicts are barriers: Can relational values help explain farmer participation in conservation incentive programs? Land Use Policy, 82, 464–475. This research was made possible by support from the Puget Sound Institute and collaboration with the Snohomish Conservation District. Dr. Mollie Chapman is a postdoctoral fellow at the University of Zurich in Switzerland, where she studies the relationship between people and nature. She has interviewed farmers in Colombia, Costa Rica, USA and Canada. I use ‘farmer’ to refer to a variety of people who own and manage designated agricultural land, including full and part time agricultural producers, hobby farmers, nursery owners, and those who board horses.